All seven testing kits together. Includes 1 each of the Mandelin, Mecke, Marquis, Folin, Froehde, Liebermann and Ehrlich's Reagents (7 kits / 8 bottles total). Each bottle contains enough reagent for approximately 50 tests. 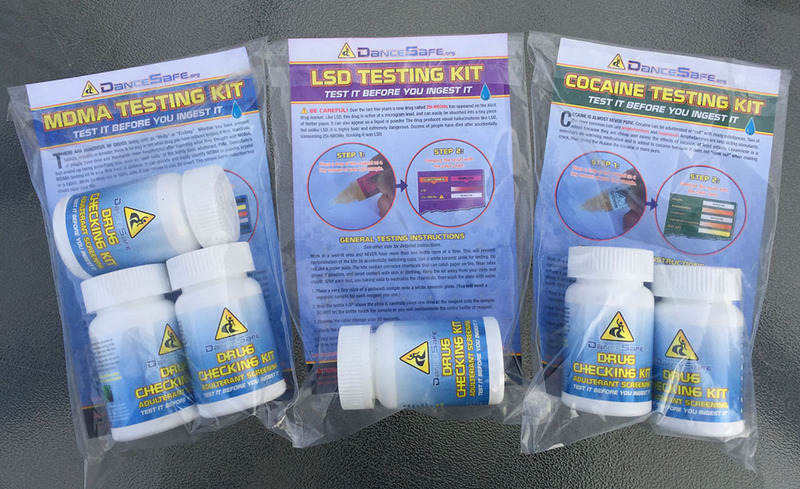 All seven testing kits in one convenient and cheaper package! 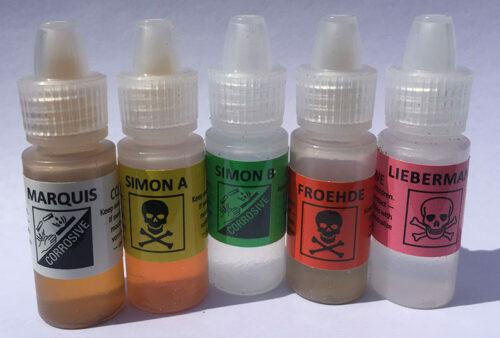 Includes 1 each of the Mandelin, Mecke, Marquis, Folin, Froehde, Liebermann and Ehrlich’s Reagents (7 kits / 8 bottles total). Each bottle contains enough reagent for approximately 50 tests. Mandelin Reagent (blue kit): Good for detecting ketamine and the deadly adulterants PMA and PMMA. Also tests for the presence of MDxx, meth/amphetamine, certain substances from the 2C group, and some opiates. A solution of sulfuric acid and ammonium vanadate. Mecke Reagent (red kit): Good for detecting 2c-T-x compounds and certain opiates. Also produces clearly different color reactions for DXM and MDMA. 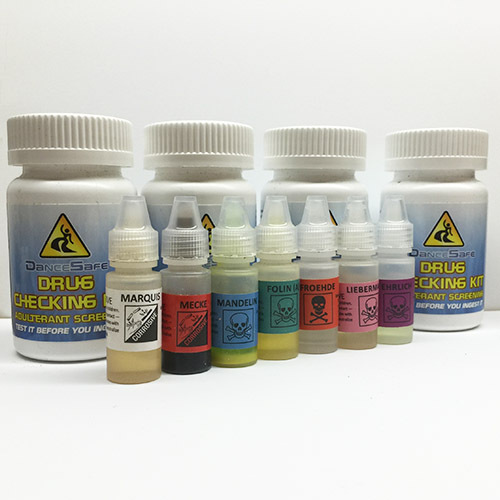 Marquis Reagent (white kit): Marquis was our very first kit. It is an excellent field test for a wide variety of substances. Folin Reagent (turquoise and green kit): Folin Reagent is a secondary test that tells the difference between MDMA, MDA, and MDE. It also detects pierazines such as BZP and TFMPP. Contains two bottles. Folin reagent should never be used alone. It is only useful after first testing your sample with Marquis, Mecke or Mandelin. If a substance tests positive for an MDx substance by turning black with Marquis, Mecke or Mandelin, then a salmon-pink color change with Folin indicates the presence of MDMA. A yellow-orange reaction indicates MDA, and no reaction indicates MDE (as of 2015, MDE is extremely rare). 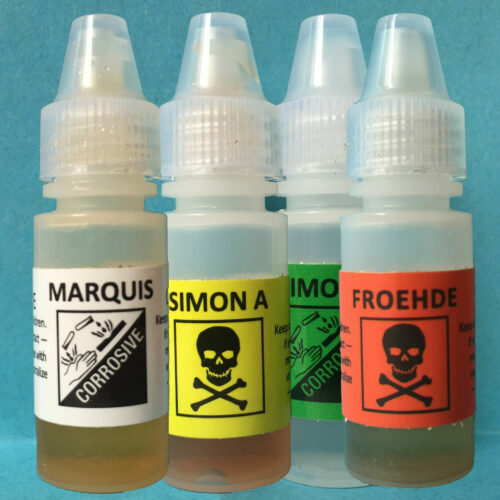 Froehde Reagent (orange kit): Froehde is an advanced kit and when used in conjunction with our other kits can help identify various new psychoactive substances. 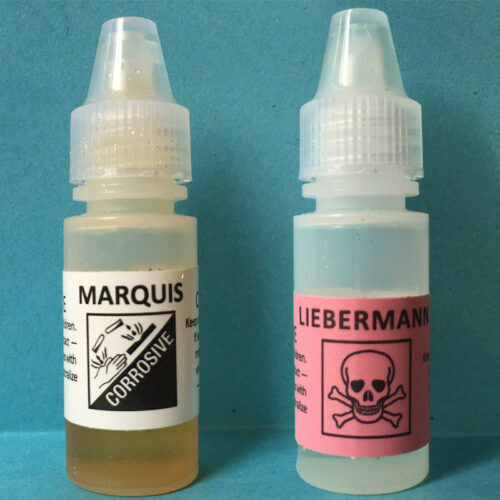 Liebermann Reagent (pink kit): Liebermann is an advanced kit and when used in conjunction with our other kits can help identify various cathinones (“bath salts”) and other new psychoactive substances. Ehrlich’s Reagent (purple kit): Ehrlich’s reagent can be used to positively identify LSD, helping rule out 25i-NBOMe, an extremely dangerous drug that is often misrepresented as LSD.